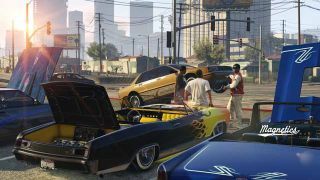 As we posted about on Friday, the Lowriders update for GTA comes out tomorrow. There's since been another trailer, this one featuring even more sweet hydraulics than the first. It shines the spotlight on Benny's Original Motor Works, showcasing the various new ways you can pimp out your wheels. The shop in question can be found in the Strawberry neighbourhood, and offers a host of customisation options you won't find anywhere else. The update isn't just adding cosmetics; there'll be new guns, new missions and a 'Player Interaction Menu' that'll allow you to open doors, pop your hood and turn up the radio. Finally, I can roll around the streets of Los Santos blasting Mozart at people, wildly opening and closing my trunk for no reason other than that I can. Look, when I last heard the term 'lowriders' it referred to people who go round with their trousers pulled down so that their underwear's showing, so all this stuff about cars is a little underwhelming. Each to their own.